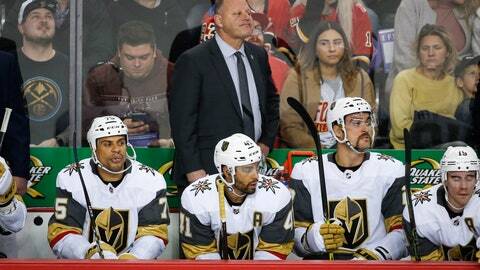 LAS VEGAS (AP) — Gerard Gallant insisted over the first two months of the season that the Vegas Golden Knights would be fine once they found their rhythm and re-established the type of chemistry that led them to the Stanley Cup Final last season. Apparently, Gallant knew what he was talking about. Vegas has won a season-high four straight after trouncing the Blackhawks 8-3 on Tuesday night. The Golden Knights (13-12-1) are right back in the playoff race after sitting near the bottom of the Western Conference less than two weeks ago. Patience is something center Jonathan Marchessault said the 53-year-old soft-spoken coach has always had, from their time together in Florida and now in Las Vegas. Marchessault said Gallant’s top priority always has been to assure his players he has faith in them. Goaltender Marc-Andre Fleury has won his last five starts. After ranking near the bottom of the league with its offensive production, Vegas has won five of six by outscoring its opponents 25-8 in the victories. The emergence of Alex Tuch, Cody Eakin and newcomer Max Pacioretty on the second line has bolstered the team’s offense. The biggest surprise has been Eakin, who had two goals and an assist in the victory over the Blackhawks. Eakin has 10 goals and six assists in 23 games after he had 11 goals and 16 assists all of last season. The eighth-year pro said Gallant’s approach has helped his confidence, which is why he has been able to take advantage of his time on the second line while Erik Haula recovers from a lower-body injury. Gallant said the Knights have found the rhythm he was looking for since the start of the season, when they opened up with five of their first six and 11 of 18 on the road. Most importantly, he said, is how well the Knights have played against the Pacific Division. Vegas has the best record among all eight teams, going 6-1-1 thus far, including Fleury’s back-to-back shutout wins over Calgary and San Jose last weekend. “You look at our division, I don’t think it’s got off to a great start in our whole division, but I think there’s a lot of good teams there and I compare our team to the other teams and if we play the way we played this weekend, we’re right there,” Gallant said.